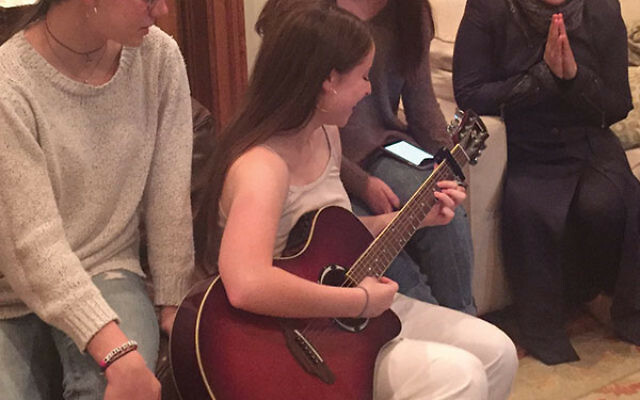 Alma Schneider’s daughter plays the guitar in front of friends and a Syrian guest on Thanksgiving. For Thanksgiving this year, Emily Pollack, a freshman at Mount Holyoke College in Massachusetts, made a sign in Arabic that she hung on the front door of her family’s home in Montclair; it read, “Welcome” and “We Support our Muslim Neighbors.” She also made bilingual labels for all the food on the table. That’s because along with the usual array of friends and family, her parents, Sharon Pollack and Kathryn Crawford, also hosted a family of Syrian refugees recently resettled in Elizabeth. They were among 21 local families, including at least one Jewish religious leader (Rabbi Mary Zamore in Westfield), one Orthodox Jewish family in Teaneck, and a church (Union Congregational Church in Montclair), that hosted 24 refugee families, mostly from Syria but also from Iraq, who have settled in New Jersey in the last year. McCaffrey and Macall have been coordinating efforts on behalf of the refugees through Bnai Keshet, where Emily Pollack and her family are members, for over a year. They launched a “Christmas” dinner at the synagogue in 2015, and have continued with summer camp scholarships for refugee children, “adoption” of a refugee family, a synagogue interfaith Passover seder, and, most recently, weekly dinners in people’s homes. The biggest challenge during the Thanksgiving meals, according to two hosts and several guests who spoke with NJJN, was the language barrier. Many of the refugees don’t speak English, and participants had little more than Google Translate to communicate with each other. Still, communication remained basic. “We did not have a conversation about the election. That would be way too complicated. We were on, ‘Do you have a dog?’ or ‘Where are you from in Syria?’” said Schneider. But even that turned very emotional: The father of the Syrian family she hosted was “almost crying” as he showed before-and-after videos of their hometown on a smartphone, according to Schneider. 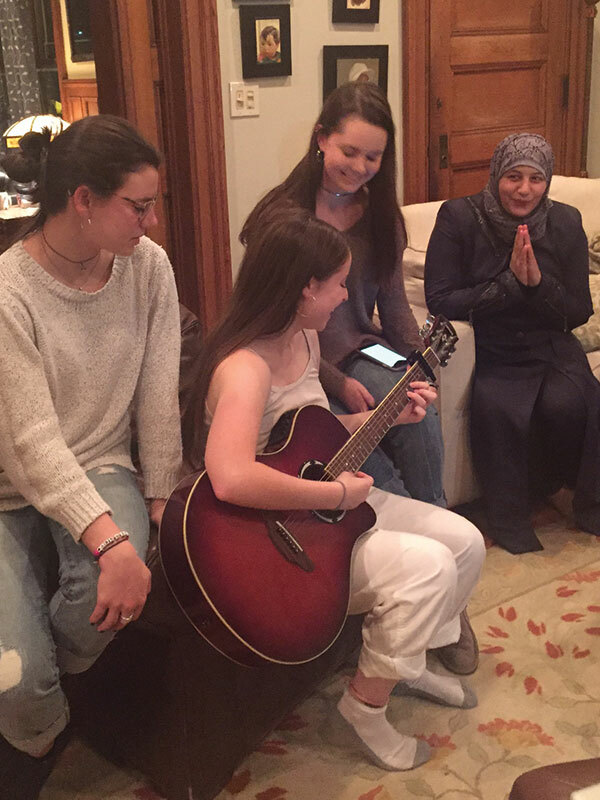 Through an interpreter, Omar’s 16-year-old brother, Gazwan, said, “We were making conversation through the phone, through Google Translate, but it would translate things wrong and everyone would laugh.” Still, he was impressed with Schneider’s daughter’s musical talent and said she let him try his hand at the guitar. “I tried, but failed,” he said, smiling. As Schneider laid a spread that included deep-fried turkey, pecan cornbread stuffing, roasted Brussels sprouts, butternut squash, sweet potatoes, mashed potatoes, and cranberry relish, as well as a lasagna (“I was afraid we wouldn’t have enough food,” she said), she recalled that her Syrian counterpart started pulling up photos of her own specialty dishes and invited the Schneiders to a meal at her home. “We’re really excited to meet up with them again and hopefully they’ll speak English in a few months,” said Schneider. A majority of the hosts live in Maplewood and Montclair, but refugee families were also placed for the holiday meal in Teaneck, Livingston, Mountainside, Bloomfield, and Madison, and, McCaffrey said, it was “a bit of a scramble” to find the hosts. As Thanksgiving approached and she was still short and asked anyone she could — including “one unsuspecting woman I grabbed in the South Mountain Reservation on the Wednesday before Thanksgiving,” who ended up hosting a family of eight. There were bumps in the road. One family that initially expressed interest in being hosted backed out after being placed. “The mom had second thoughts about descending upon a strange family with her five small children,” said McCaffrey. “This makes you realize how gutsy everyone was who participated.” Another family couldn’t attend due to health issues. Said McCaffrey, “The whole project was a leap of faith: strangers opening up to one another. Prior to Thanksgiving, there was a lot of chatter on the media about how U.S. families might not tolerate sitting at the table together post-election.